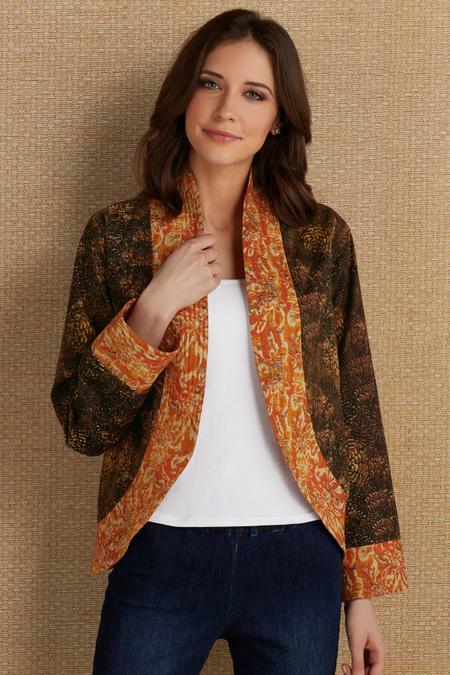 Beautifully crafted from a fine-weave cambric, this exquisite jacket catches the eye with a continuous colorful border ribbed with slim rows of top-stitching. Ditto on the cuffs. An artful quilting effect is achieved without the bulk. Lined with a satiny black poly. Long set-in sleeves. Mid-length. Cotton/polyester. Misses 26" long.